Total Desktop Management | STL Communications, Inc.
STL Communications, Inc’s. 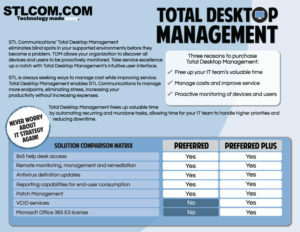 Total Desktop Management (TDM) eliminates blind spots in your supported environments before they become a problem. TDM allows your organization to discover all devices and users to be proactively monitored. Take service excellence up a notch with Total Desktop Management’s intuitive user interface. STL is always seeking ways to manage cost while improving service. Total Desktop Management enables STL Communications to manage more endpoints, eliminating stress, increasing your productivity without increasing expenses. Total Desktop Management frees up valuable time by automating recurring and mundane tasks, allowing time for your IT team to handle higher priorities and reducing downtime.